We interrupt this program to bring you this late-breaking bulletin: In the beginning, there was live TV. The migration from radio had begun. From Donna Reed’s perfect family to Marshal Dillon and Joe Friday, from the Texaco Star Theater to You Bet Your Life to I Love Lucy, all across the country, Americans begin to build their routine around their favorite shows. A new lexicon is quickly established: TV Dinner. Sitcom. “To the moon, Alice.” Soon, familiar faces like Bob Hope, Jack Benny, and Groucho Marx are joined by “new” performers, and cowboys, spacemen, and loyal dogs and horses crowd the screen as the battle for ratings begins. This entry was posted in PrimeTime and tagged 1950 by Skooldays. Bookmark the permalink. 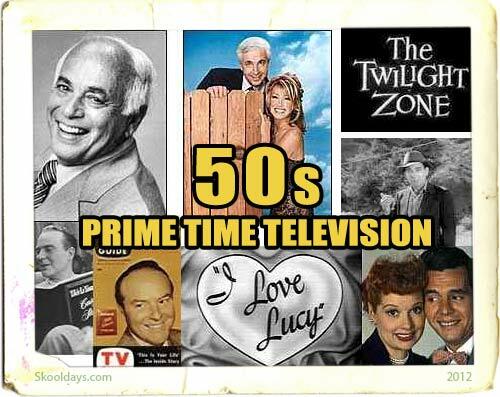 I have another tv series that I would like to add to “The 1950’s Prime Time” TV Section of your”Skooldays”website. “The Shirley Temple Theater”/”The Shirley Temple Storybook”/”The Shirley Temple Show”. ABC/NBC TV Networks Januar7 12,1958 to 1961. Mrs.Black hosted this family anthology series..where she would introduce specially produced tv adaptations of popular children’s stories that featured well known performers..playing the characters. More often than not..Mrs.Black would also perform in certain installments of the show:”The Land Of Oz” as”Tip”/”Princess Ozma”,”Winnie The Pooh” as the mother of”Christopher Robin” and “Babes In Toyland” as “Floretta The Gypsy Witch”. (Mrs.Black’s three kids:Daughters Susan and Lori and son Charles Black,Jr. also appeared with their famous mom on the show). During it’s early run on The ABC TV Network..the series was titled”The Shirley Temple Theater”..the series titled would later change to”The Shirley Temple Storybook”.ABC TV dropped the show in 1960 and the program moved to The NBC TV Network..where the series titled was changed one more time to”The Shirley Temple Show”..the series remained on the air..until the heads of NBC TV closed Mrs.Black’s storybook in 1961. Episodes from the series run on NBC TV has been rereleased on the home video market..first on VHS Videocassettes and later on DVD. I hope that you might add “The Shirley Temple Theater”/”The Shirley Temple Storybook”/”The Shirley Temple Show”to the 1950’s “Prime Time”TV Section of your “Skooldays’ website? The air dates for the show should be ABC/NBC TV Networks January 12,1958 to 1961..my apologies for the inaccurate info that I had submitted here.